The Tigercat 480B tracked mulcher turning pine slash and stumps into a mulch carpet. A few years ago the pioneers of mulching were mainly the private farmers in northern KZN and Piet Retief who were prepared to bite the bullet and follow their farming instincts to protect the soil on which their livelihoods depend. Now mulching has gained wider acceptance and has been adopted by a number of big corporate growers. 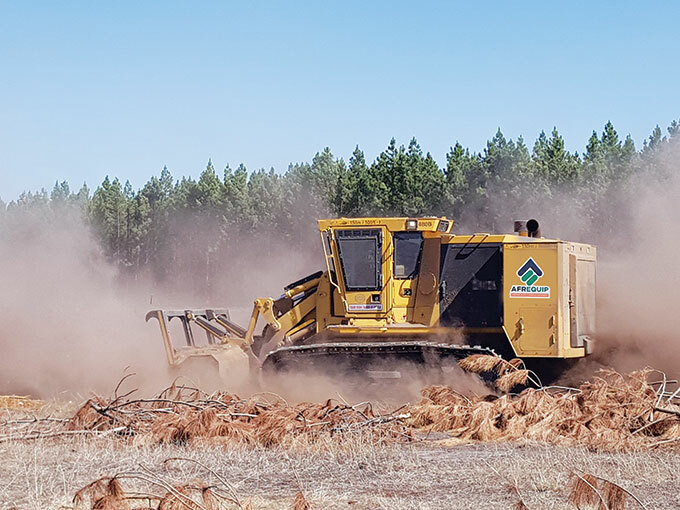 This trend has gained momentum throughout the South African forestry landscape as the process of mechanizing (modernizing) of forestry operations such as pitting, planting and harvesting, has taken off. 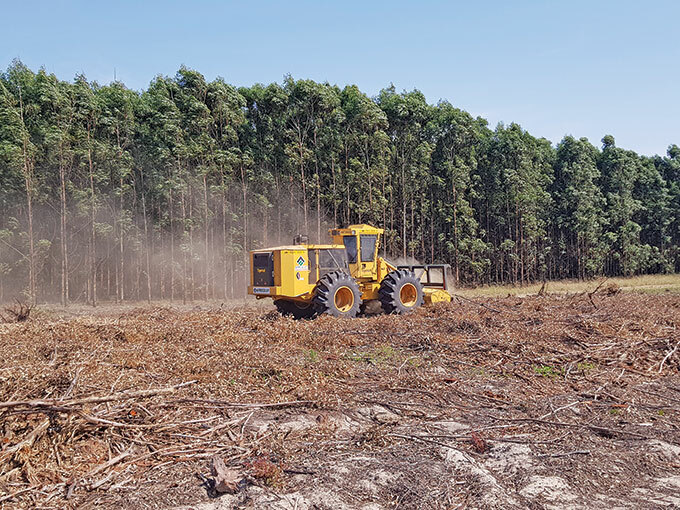 The fact is that mulching the slash and stumps behind the harvesting operation provides ease of access to forestry compartments for a whole range of modernized systems. 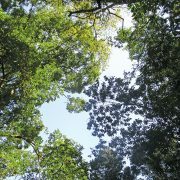 This – apart from numerous other benefits it brings – provides an opportunity to maximize the productivity gains that modernized forestry systems can offer. 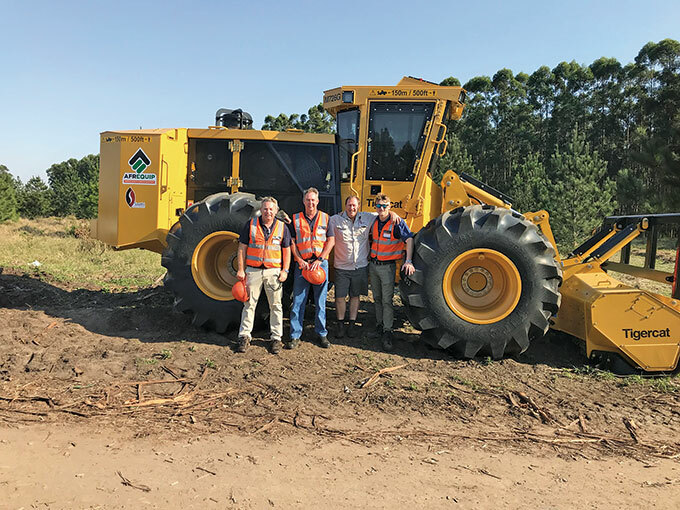 The recent landing in South Africa of two top of the range, heavy duty Tigercat mulchers, is a clear sign that mulching has well and truly arrived. The big boys are in town. The AfrEquip and Grand Bridge Trading teams at the handover of the Tigercat 480B. The first is a Tigercat 480B tracked mulcher, acquired by Grand Bridge Trading. The company has secured a contract from Sappi to mulch 800 ha this year, and 800 ha next year – at Lothair in Mpumalanga. Alastair Fagg of Grand Bridge says the company has years of experience operating heavy earth moving equipment in the mining industry, and saw an opportunity to diversify into mulching and land care several years ago. 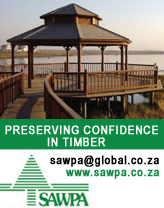 The Sappi contract involves mulching post harvest slash and stumps in pine and gum. The Grand Bridge team works 24 hours around the clock, mulching up to six hectares in a 24-hour cycle. Alastair says his team has learned a lot of hard lessons, settling on the Tigercat 480B tracked machine after careful consideration. Alastair said that a lot of R & D went into re-configuring the drum and teeth on the mulching head to adapt it to local conditions. 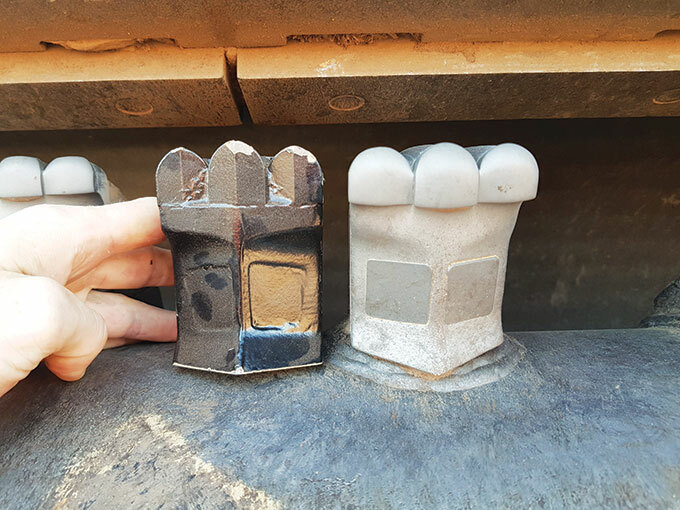 Above and below: The durable teeth on the mulcher head last longer and miss nothing. Alastair says sand and dust is a killer, so maintenance is a big issue. The object is to mulch all the slash and stump material above the ground level without disturbing the soil. He refers to it euphemistically as “composting the plantation”. The other mulcher that landed in SA recently is the Tigercat M 726 G wheeled machine, acquired by Savithi Trading, working for Sappi in Zululand. 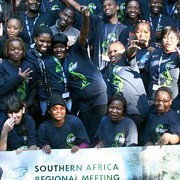 Deon Redinger of Savithi Trading comes from a timber and sugar farming background, and saw an opportunity several years ago to move into land clearing and mulching to provide alternative solutions for farmers and foresters in the face of looming climate change. Following extensive consultation with overseas experts and their own R & D process, Deon settled on the Tigercat wheeled mulcher. At the handover of the Tigercat wheeled mulcher to Savithi Trading in Zululand (left to right) John du Toit (AfrEquip Managing Director), John Barbour (AfrEquip Technical Manager), Deon Redinger (Savithi Trading Director) and Brendan Moore (AfrEquip Business Development Manager). Deon says his team has mulched 700 ha in three months with two machines. He’s done lots of R & D with the teeth on the mulching head to configure it right. “We have to get the brushlines and stumps down to ground level to create a covering that allows easy planting,” he said. 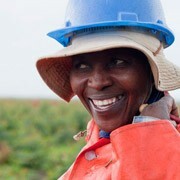 Productivity is around 2.5 to 3 hours per hectare. He’s been running the Tigercat for a while now and is “very impressed” with it. “The machine runs behind the mulching head so the tyres are running on the mulch layer, so compaction is not an issue,” he said. When it comes to mulching large areas, Deon is in agreement that size counts. The wheeled Tigercat mulcher reducing post-harvest gum slash and stumps to compost. Sappi’s Forestry manager stationed at Kwambonambi in Zululand, Jeffrey le Roux, is a firm believer in the benefits of mulching. 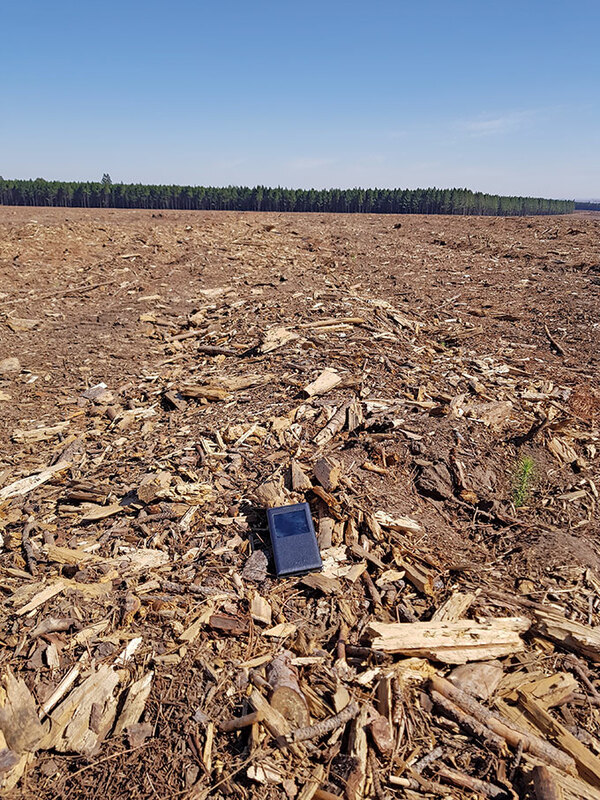 A few years ago Sappi management decided that there would be no more burning of slash in Zululand – it would all have to be mulched. There have been a lot of lessons learned along the way, but Jeffrey has seen the benefits of mulching in the productivity of the Zululand plantations. MAI is up, TUP is significantly reduced, improved access to compartments for modernized equipment has resulted in improved productivity across the board, there has even been a reduction in wildfires. Before they started mulching, the turnaround time between harvesting and re-planting was 3-6 months. Mulching has extended the planting window and reduced that to a month. Before the advent of mulching, the young seedlings were planted in exposed soil left behind after the burning of slash, and would be sand-blasted in the strong winds that blow in Zululand. Mortality was high and blanking is a costly operation. Now the young plants are protected by the mulch ‘carpet’ that also locks in moisture and nutrients. The elimination of stumps – a favourite home for beehives – has helped reduce wildfires because there are no honey hunters around lighting fires carelessly to smoke out bees. The mulch carpet provides a perfect finish for the pitting and planting teams to come in and do their thing. 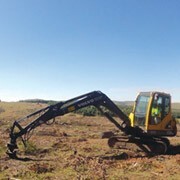 The Tigercat mulchers – like all Tigercat equipment – are supplied and backed up throughout southern Africa by local firm, AfrEquip. The AfrEquip team – as always – was present on site to hand over the new mulchers to the customers, making sure they are running smoothly and meeting their high expectations. In the past the Tigercut mulchers were equipped with outsourced mulching heads, but no more. 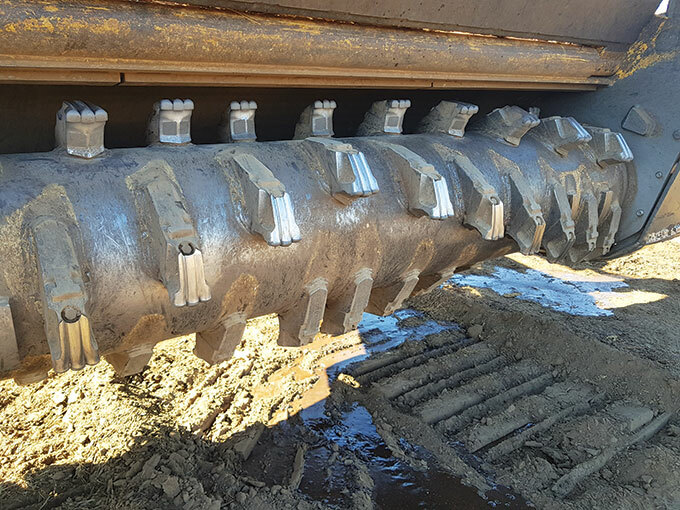 The Canadian manufacturer now designs and builds their own mulching heads to meet their high standards of rugged reliability and productivity. “The reaction time for research and development, and for spares and maintenance on the equipment must be quick. That’s what the customer needs in a new application like this,” added Brendan. He said feedback received from customers on the equipment is a key factor in the design and build of all Tigercat machines. 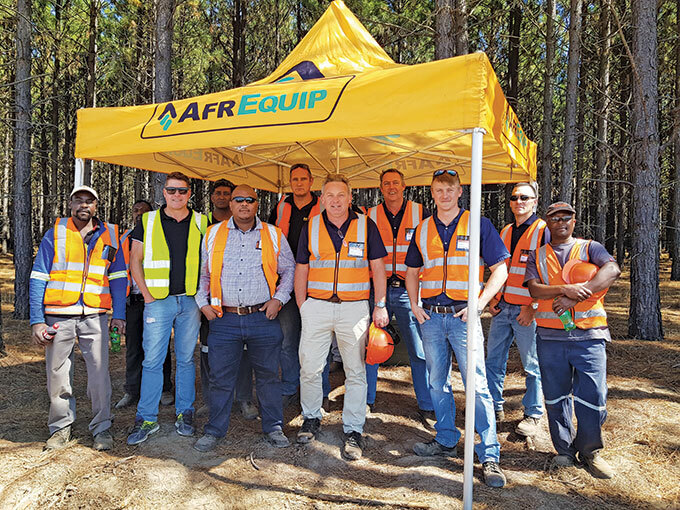 In order to ensure adequate backup for customers, AfrEquip has established well equipped and staffed depots in forestry areas around the country, including Pietermaritzburg, Richards Bay, Piet Retief, Ugie and Nelspruit. 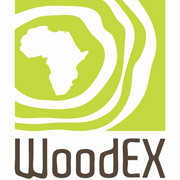 AfrEquip also supplies and services customers in Zimbabwe and Namibia. Brands supplied by AfrEquip include Tigercat (mulchers, skidders and harvesters), Log Max (harvesting heads), Morbark (chippers and de-barkers), Nokian (tyres) as well as Gierkink (felling saw) and Olofsfors (tyre chains). The Tigercat 480B tracked mulcher (546 hp) and M726G wheeled mulcher (370 hp) are equipped with powerful Tier 2 engines and high capacity cross-flow cooling systems. An automatic reversing cycle purges dust and debris, and there is clear access to engine and working components for easy maintenance routines. They are equipped with Tigercat 4061 mulching heads which automatically follow the terrain countours. Operator comfort and safety is paramount, and the cabs conform to the highest standards of all Tigercat forestry machines. The wheeled unit can be easily switched from a mulcher to a feller buncher, proving its versatility in forestry applications. If you liked this article, check out Reducing fuel loads inside timber compartments.